If we were to sum up the Smart Tab 2 in a word, it'd be "inoffensive". That isn't an insult: it does a reasonable job of doing what you'd expect without alarms or surprises. Just watch the total cost of ownership. Inoffensive. If this was a one word review, that's how we would describe the Vodafone Smart Tab 2. Which, in today's increasingly over-crowded multi-tablet market, isn't a bad description to carry. We can't imagine the marketing department will be plastering billboards with "inoffensive, says TechRadar" – but rest assured that it's not an insult. The Smart Tab 2 is built like it's ready for medieval war with its thick plastic dotted armour, which is encompassed by a metal outer-rim that, overall, weighs a ton. Well, not an actual ton, more like 400g, which is pretty hefty for a 7-inch "on-the-go" tablet. It's not the star striker, it's the often ignored utility man who makes up the numbers – it's the John O'Shea of the tablet world. Its functionality is impressive, boasting 3G, front and back cameras and it has all of the glory and guff that comes with an Android OS. But there are some obvious drawbacks that places this tablet squarely in the second tier, namely the woefully small 4GB of on-board data, a very basic 1GHz processor and an average quality screen. The Smart Tab 2 is 7 inches of solid rubber and metal and is subsequently one of the heaviest tablets in its category on the market. If you're looking to do some light reading in bed, or hold this in your hand for an extended period of time, then you'll probably need some sort of wrist support. The upside of such a solid build is that it's (almost) damage proof, the rubber back acts as a cushion should you drop the device when your iron grip fails and your arms wither. Although do you really want to sacrifice mobility for sturdiness? Standard features such as a headphone jack, a micro-USB port and volume buttons are included – but there's also the added bonus of SD and SIM card slots. The Smart Tab only carries 4GB of on-board memory, most of which is taken up by bloatware – so purchasing an SD card will be imperative. The SD card slot, however, will only house up to a maximum of 32GB. There's no light sensor for auto-dimming and the screen suffers in direct sunlight. The screen itself is a reasonable 1024x600, but with more and more affordable 7-inch tablets coming with 1080p as standard – such as the Nexus 7 and Kindle fire HD – it looks a bit dated. Edges of apps are pixelated, browsing doesn't looks as pretty as it could do and the colours look washed out, which is very noticeable if you've ever used a more accomplished tablet like the iPad mini. 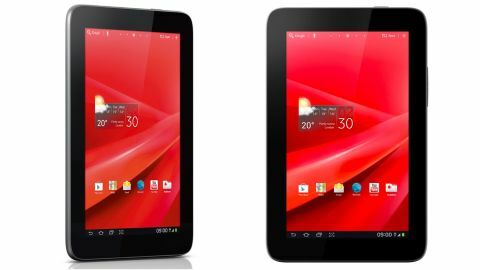 However at £149 you can't go expecting the world from the Smart Tab 2.